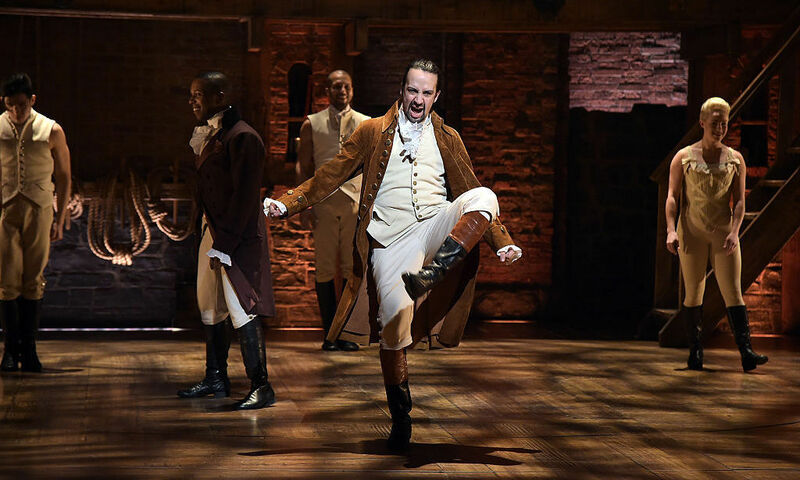 'Hamilton' Nets Record 16 Tony Award Nominations : The Two-Way Lin-Manuel Miranda, the creator and force behind Hamilton, is nominated for three individual awards, including best performance by an actor in a leading role in a musical. 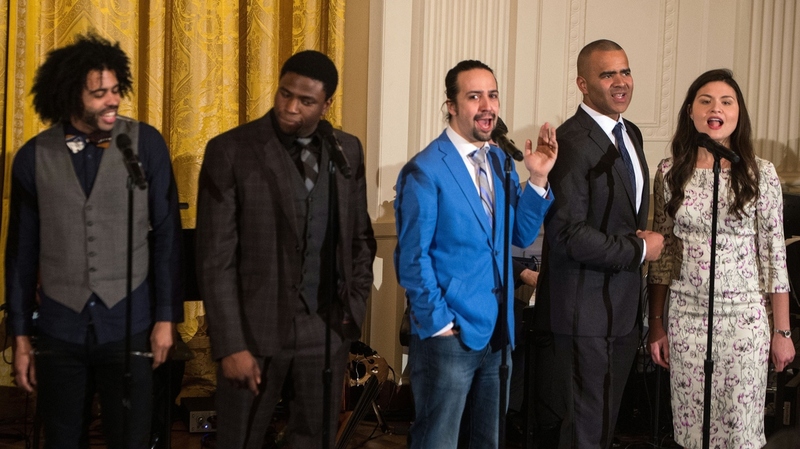 Actor and composer Lin-Manuel Miranda (center) performs on stage during a rehearsal of Hamilton ahead of the Grammy Awards in February in New York City. Hamilton eclipsed the 15 nominations that were garnered by both The Producers (2001) and Billy Elliot (2009). For more about the musical, see this post/podcast from NPR's Linda Holmes. Lin-Manuel Miranda, the creator and force behind Hamilton, is nominated for three individual awards, including for best book, best original score and best performance by a lead actor in a musical. Hamilton got more Tony nominations than either The Producers or Billy Elliot did in their respective years. 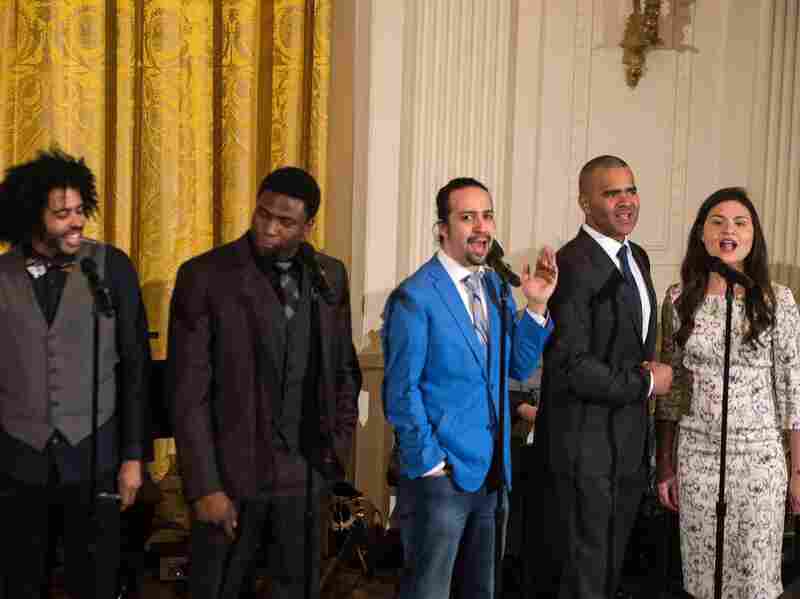 Here, Broadway cast members including the show's creator and star, Lin-Manuel Miranda (in blue), performed at the White House last month. As Jeff Lunden reports for our Newscast unit, Shuffle Along scored 10 nominations despite being the last musical to open this season. Looking at other categories, Jeff adds, "Revivals of Long Day's Journey into Night, A View from the Bridge and She Loves Me dominated their categories." The Tony Awards show will be broadcast live on CBS at 8 p.m. ET on Sunday, June 12.